Pretty typical of Trampled by Turtles. 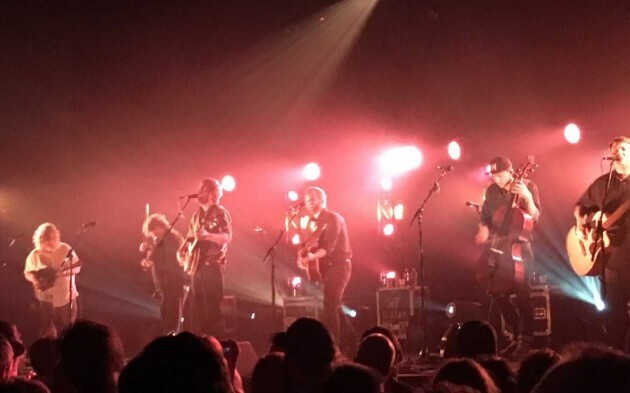 Instead of piling on any specific fanfare or showing off a more dramatic side for their tour kick-off and first advertised show in 20 months, Minnesota’s famed acoustic pickers maintained a no-biggie, workmanlike attitude during their 1¾-hour set Friday at the Palace Theatre. It wasn’t exactly Trampled at its finest or flashiest, but there was a steadfastness and focus to the concert that simply, admirably reiterated the band is back in business. Even the booking was rather nonchalant: two nights at St. Paul’s newly renovated theater, when ticket demand clearly suggested they could have played four or more shows there or made their comeback at a much bigger venue (like Bayfront Park in Duluth, where they return July 6). Partly to appease fans shut out at the quickly sold-out Palace gigs, they paired with 89.3 the Current to do a live video stream from Saturday night’s gig there (showtime is about 10:15 p.m.). After an earnest, florid set by the Pines that was unfortunately drowned out by excitedly chattering Trampled fans, the headliners took to the stage following a conspicuously picked walk-on song: Thin Lizzy’s “The Boys Are Back in Town.” That sentimental vibe carried over into the show's opening tune, “Life Is Good on the Open Road,” also the title track to the new album issued Friday after a four-year recording lull. Both nerves and emotions seemed to tether the song down, but frontman Dave Simonett openly shrugged off the languid start. “Now that we got that one over with, I can relax,” he said. By “relax,” he apparently meant let the floodgates open. The band then blazed through two of the new record’s fastest, most hyper-picky tracks: the single “Kelly’s Bar” and the aptly named “Annihilate.” Four new songs total opened the set, keeping the crowd itching to cut loose before the band finally scratched out the beloved oldies "Help You" and “Victory.” The latter sparked the first of many big singalong moments, the biggest being “Midnight on the Interstate” back-to-back with “Wait So Long” for a climactic twofer three-quarters of the way through the gig. Overall, Friday’s set couldn’t hide a tinge of rustiness and tepidness on the band’s part, plus the sound mix in the theater was rough at times. But to Trampled’s credit, what could have been a nostalgic cakewalk of a show was instead much more forward-leaning. Many other new songs were sprinkled throughout the set, with the hushed beauty of “I’m Not There Anymore” shining over the din of the talking crowd and the melodic, mid-tempo gems “The Middle” and “Right Back Where We Started” each screaming to become setlist standards. Here's the setlist from Night 1 at the Palace, and some video clips.